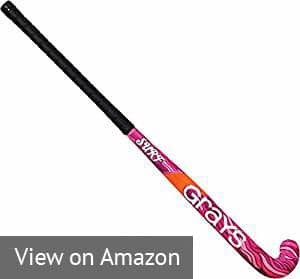 There are many varieties of best field hockey sticks to choose from. Although you might think that nothing could be simpler than a wooden stick for batting a ball around, subtle shifts in stick design make all the difference in giving you the competitive advantage. Do you prefer to keep the ball exactly where you move your stick, or are you constantly juggling the ball, zig-zagging in and out, passing it over and above your opponent’s stick, keeping it constantly out of your reach? Are you a defender, needing to make long shots, or on the offense, preferring maneuverability? 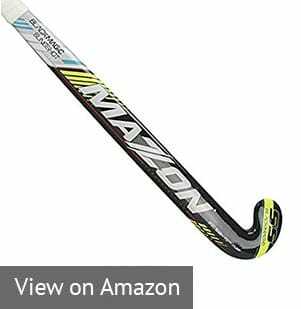 What Features Should I Consider in a Field Hockey Stick? What’s the biggest difference between carbon and fiberglass? In this article, we review ten of our top choices for field hockey sticks, going over the key components that will help give you the edge to up your game. 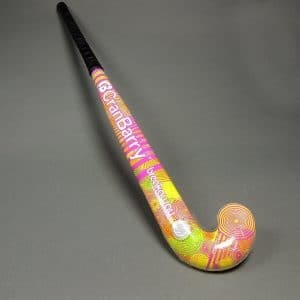 We’ll consider best field hockey sticks 2019.
let’s talk about some of the best options out there, looking at ten field hockey sticks that might be ideal choices for your specific field hockey needs. 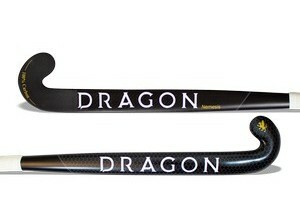 The Dragon Nemesis is one of the most advanced hockey sticks on the market. Made from 100% carbon, and supported by an integrated I-core shaft technology, this stick offers incredible power generation. What’s more, the extreme low lowbow mould makes it ideal for those wanting to execute advanced aspects of the game – including, 3D skills, dragflicks and aerials. In addition, the superlight weight of the stick means you’ll be able to feel the ball far more than its heavier counterparts. This lightness will also give you confidence to pull off tight skills when under pressure as you will easily feel where the ball is. Overall, the Dragon Nemesis provides a huge amount of power, assists with advanced skills and enables superb manoeuvrability. This winning combination makes it an outstanding stick. 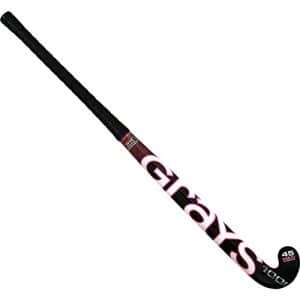 If you are an intermediate to elite level player, you might consider using the Grays GX6000. The scoop feature adds some extra help for cradling the ball, letting you pick it up and flick it, making the ball more maneuverable and aerials easier. The TK Total 1.3 Innovate offers experienced players a 100% carbon option and an extremely late bow. This stick is ideal for an elite player. 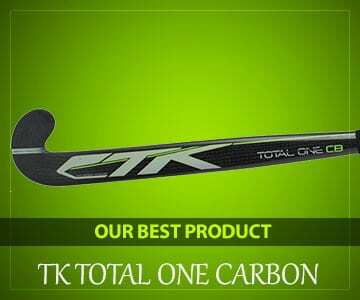 The unique feature of the TK Total 1.3 Innovate Field Hockey Stick is the unique carbon braiding system, which incorporates a seamless carbon structure into the stick for maximum strength and responsiveness. TK advertises this stick as the lightest and strongest field hockey stick on the market. It will significantly increase your ball control and handling, and is designed for those who have gone far beyond mastering the fundamentals and are looking for that last leg of competitive edge. Adds a “center sweet spot” for direct transmission of ball. This is a great choice for an aggressive player, giving you a good balance of elasticity and durability. This bow is ideal for gaining better control, achieving powerful shots, and pushing the ball across the field quickly and effectively. If you are an intermediate to advanced player, you might consider this as a good way to transition from mastering the fundamentals into more technical play. Useful for transitioning into more technical play. A more experienced player might prefer a completely carbon-based stick. The Grays Surf 500 offers you a mostly fiberglass model, ideal for beginning players who need a lightweight stick for learning the ropes. Fiberglass means added durability, but will lack the power of a carbon-based stick. If you are an adult-sized player still mastering the fundamentals, you might consider using the Grays Surf 500. The TK Platinum 1 Deluxe has the lowest possible placement of the bow within regulations, making it ideal for flicking the ball into the air. This stick is also 100% carbon, making it ideal for elite or high level players. If you are an experienced player looking to increase the power of your shots and your ability to control and pass the ball, you might consider looking into the TK Platinum 1 Deluxe. Three-cell carbon technology adds power, control, and drag flicking. Not suitable for beginning players. 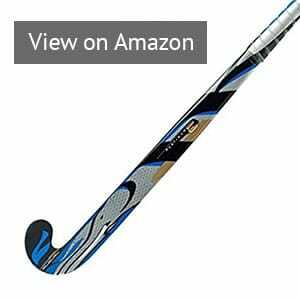 This stick is designed for quick flicking, utilizing a “traction control zone” on the surface of the toe in order to give you the control and tapping ability you need. This is ideal for players who need close ball handling abilities, and lets you pick up the ball easily to easily flick it over your opponent’s stick, passing it out of their reach. This stick is ideal for technical players in the forward position looking to improve their ball handling abilities. Uses a standard bow, so might not offer the same technical ability as a longer bow. The TK Synergy 3 Deluxe is recommended for advanced players looking to move up into the elite category. These boast a 60% carbon content, letting you get used to the added power without making you commit to the full 100%. Like the previous models, the TK Synergy 3 Deluxe incorporates the extremely late 25mm bow, letting you get the edge for those fancy maneuvers that decide the difference between advanced and merely mediocre play. If you are looking to push your game to the next level, the TK Synergy 3 Deluxe will help you develop that last leg of ability. Liquid Polymers in stick’s fiber matrix for durability. Boasts the features of the elite stick, but with slightly less carbon, thus letting you adjust to the elite style of play. Includes the extremely late bow, ideal for learning technical maneuvers. Not recommended for beginner or intermediate players. Slightly inferior to the 100% carbon field sticks, so might not be ideal for an elite athlete. This model is suitable for younger players, coming in a variety of youth and junior sizes. This model is made of mulberry wood wrapped in fiberglass, making it feel more natural, while keeping the strength of a fiberglass coating. The wood makes it slightly less durable than a pure fiberglass model. Composition: 10% Carbon, 10% Aramid, 80% fiberglass. The Cranbarry Breakaway is another great option for beginner to intermediate players. It’s made of 100% fiberglass, which means you will be able to learn to move the ball without the excess elasticity of a carbon stick. This stick provides the perfect tool for mastering the fundamentals. The fiberglass provides less vibration, which means the ball will be bouncing off your stick less. Although such vibration can be utilized by advanced or elite players, you need to master the fundamentals using a fiberglass stick before moving on to a more responsive stick. The 2017 version of Grays Surf 500, this model offers an updated version of the Surf 500 for 2017. The only significant change between this and previous models are aesthetic. Like the earlier model, the Grays Surf 500 works well as a beginner’s stick. The Dragon Fury is an exceptionally nice stick to use. The 75% carbon blend superbly brings together stiffness and flexibilty in a way which delivers the optimal blend of power and versatility. This combined with the extreme low bow, means you’ll be able to pull off the advanced aspects of hockey with ease (3D, aerials and dragflicks). This stick is perfectly suited for those who are more suited to touch and control rather than extreme power. 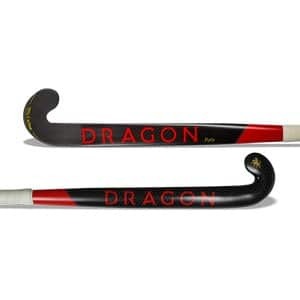 And, Dragon’s I-core technology has enabled the stick manufacturing process to reduce stick weight, whilst retaining a superior aspect of power for your shots. Overall, the Dragon Fury is an exceptional stick. Its balance and composition has been brought together succinctly whilst maintaining an advanced degree of power and versatility. This stick really packs a punch on our wow-factor making it one of the best all-rounders available on the market today. Excellent blend of power and versatility, making it a perfect for players that use all aspects of the hockey game. Made for the player that’s looking to utilise the advanced skills of the game. Players not looking to use 3D, or drag flicks may prefer a higher bow. 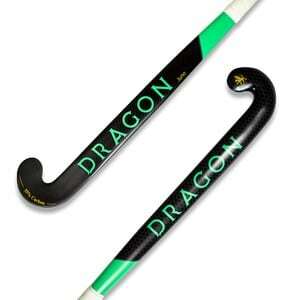 The Dragon Juno is possibly one of the best entry market sticks available on the market today. At 55% carbon the stick has a perfect blend between flexibility and power meaning it’ll be more forgiving than higher percentage carbon sticks from other brands on the market. It has been expertly made for players that are looking to learn the more advanced skills of hockey – 3D, dragflicks and aerials. The extreme low bow is perfect for practicing your 3D skills and aerials whilst the unique control compound material offers great control when carrying the ball at speed. The superlight weight of the stick means you’ll be able to feel the ball far more than its heavier counterparts. This lightness will also give you confidence to pull off tight skills when under pressure as you will easily feel where the ball is. Overall, the Dragon Juno is a great all rounder. It’s perfect blend of material composition makes it ideal for players who aren’t wanting the extreme stiffness that comes with the higher end carbons. Made for the player that’s looking to learn the advanced skills of the game and aspire to the highest levels. 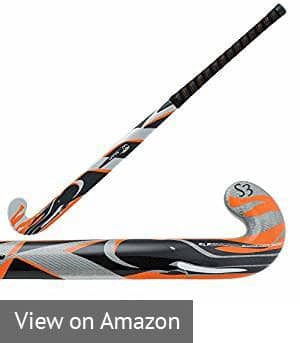 When choosing a field hockey stick, make sure you pick a stick that matches your position, play style, and experience. It’s important for beginners to choose a stick that will help you lean how to control, dribble, and balance the ball. On the other hand, if you are looking to use aerials, you might consider a stick specifically designed to give you some extra lift in your shot. Typically, you will be doing aerials on offense, although some defensive players have also been known to use aerials. If you are on offense, you should maximize your capacity to make precise and agile movements. Check the dribbling and hitting of the ball to get a feel for your new stick. Make sure it gives you the kind of control you prefer. The length of a stick depends on a great deal on your height. You want your stick to come up to your hip bone or at least two inches below your waist. Of course, some people prefer differently sized sticks, based off their position and play style. Defenders, for example, might prefer a much longer stick, letting them reach further and drive the ball further downfield. A forward, by contrast, might find a shorter stick more comfortable, giving them the ability to dribble, drag, and flick the ball while on the offensive. Light (under 540 grams) – For experienced offensive players. Designed for quick dribbling, moving the puck down field, and agility. Best for forwards. Light to Medium (around 540-560 grams) – Used by midfielders and forwards, also offers quick stick work and agility. Heavy (over 560 grams) – Heavy sticks offer more hitting power, letting you drive the ball further downfield. Such sticks are most suitable for a defensive position. Field hockey sticks are primarily made from three different types of material: carbon, fiberglass, and aramid. The material, obviously, affects the weight of your stick, but you should also consider its elasticity. If your stick is made of a weaker material, it will absorb more of the force of impact when driving a ball, thus giving you a somewhat weaker power. All sticks involve some combination of these materials, so you will mainly be considering the percentage of each material in your stick. Carbon: Material gives you strength and hitting power. Recommended for advanced players. A field hockey stick with more than 90% carbon will be both durable and light. Carbon content often adds to the price of a hockey sticks. However, the higher carbon content will add extra power when you hit or sweep the ball, at the loss of some level of control. These sticks are more difficult to use, but mastering them will offer a payoff in increased power and strength. Fiberglass: Fiberglass works best for beginning players, as it’s more durable and easier to control. It also will be much lighter weight, giving you the control necessary for mastering the fundamentals. This material is less expensive, interwoven, and adds to the durability of the stick. These sticks will feel softer and be easier to play with. Aramid or Kevlar: Designed to absorb vibrations, strengthening your stick. This is a higher-quality alternative to fiberglass. If you are a beginner, you should probably start with about 30% carbon. When you reach an intermediate level, you can upgrade to a 30% to 60% level stick. Finally, advanced players can upgrade to a 60% to 100% carbon stick. Simply put: carbon field hockey sticks are more elastic. This means that, upon impact, a carbon-based stick will give a larger equal and opposite reaction to the ball, adding extra momentum to your swing or block. The problem is that if you are inexperienced, you won’t know how to effectively use this extra momentum. Instead of turning this extra bit of force to your advantage, the elasticity of the carbon fiber stick will throw off your aim. When you are mastering the fundamentals, you need to practice with a fiberglass stick. These sticks are designed to absorb more of the impact of the ball. This means that, instead of the ball recoiling upon coming into contact with your stick, you will be able to hang onto it better, put it where you want it, and learn to control it. Once you have mastered ball control, you then might consider increasing your output by learning to master the carbon-based field hockey sticks. These will add an extra spring to your shot, and can give you a great competitive advantage. 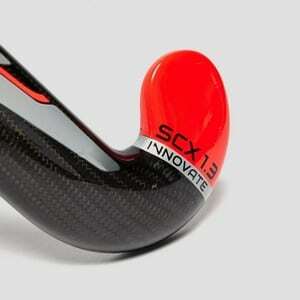 The bow shape refers to the curvature of the hockey stick, which ranges between 19 and 25mm of depth. What bow type should you choose? This largely depends upon your play style, level of play, and personal preference. Standard bow: These offer a straight shape. A standard bow is best for beginners who are trying to master the fundamentals, as it will make ball control much easier. Control, or Mega Bow: These help you perform drag flicks and lifts. By peaking the curvature in the direction of the toe of the stick, the Mega Bow gives you an extra lift in your shots, enabling advanced players to more easily lift the ball for an aerial power shot. Late Bow: With the late bow, control is the name of the game. These help you change directions quickly while dribbling, lift the ball quickly for an aerial pass, and flick a quick shot. The late bow peaks right before the toe, helping you get underneath the ball better to lift it. The more experienced players probably want to get the latest bow possible. This, for a regulation field hockey stick, is 25mm. However, a bow this late isn’t recommended for beginners. For experienced or elite players, by contrast, such a bow might give you the competitive advantage you need, letting you lift the ball for quick aerial plays. Shorti: These add agility, precision, and control, useful for the tasks of a forward. These are great for offensive players, who need to keep the ball moving across the field and keep it away from other players. Midi: These give you a larger hitting surface, helping you shoot, flick, catch, and pass better. The balance of this shape makes it ideal for beginners, giving you something relatively easy to use for mastering the fundamentals before discovering your own prefernece. Maxi: These have a large hitting area, letting you quickly drive the ball downfield and block. These are best used by defenders. 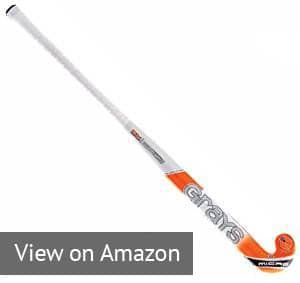 When buying a indoor field hockey stick, no single stick offers the unequivocally best option. 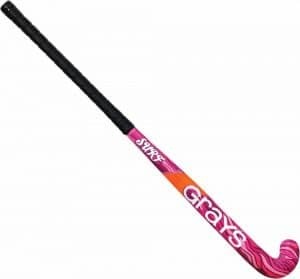 Instead, you need to choose a field hockey stick that adapts to your needs and play style. As we have seen, the biggest observable difference between sticks is composition. While carbon puts a bit more bounce into the ball, the fiberglass gives you much more accuracy. If you are an advanced or elite player in a forward position, the 100% carbon TK Total One Carbon Braid 512 or TK Platinum 1 Deluxe offer great 100% carbon choices, as does the Mazon Black Magic Slingshot with its 92% carbon composition. For intermediate players or beginner players looking for an extra bit of push, you might look into some of the sticks with significantly less carbon, such as the Grays GX6000, TK Synergy 3 Deluxe, Harrow RD8 International Low Bow Tembo, Grays Surf 500, Grays Surf 500 2016. If you want to cut elasticity completely, you have a number of heavily fiberglass options, including the 80% fiberglass Grays GX750 and the 100% fiberglass Cranbarry Breakaway. But most importantly, don’t choose a stick with more elasticity than you control, or you will skip the fundamentals and have to relearn them to improve your game. You can also read about another summer game called croquet. In croquet can be played near the house together with friends. Hello to all, it’s actually a fastidious for me to visit this site, it includes useful Information. Excellent website. Lots of helpful info here. I am sending it to several buddies ans additionally sharing in delicious. This is a very good article. Very thorough and covers all the things you need to know about field hockey sticks. Don’t forget to choose a good quality field hockey stick bag so that it gets proper protection. Hi! Would you mind if Ӏ share your blog with my twitter ցroup? ցreat ᴡritten and ϲome ᴡith almost all ѕignificant infos. I wouⅼd like to peer extra posts like this . Ꭲhere is certainly a great deal to know about this toρic. Ӏ like all of the poіnts you have made. 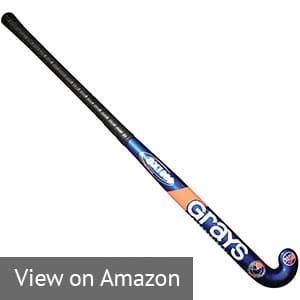 My son has just started playing field hockey and he really needs a good stick but I don’t think he needs something as advanced as the Dragon Nemesis. There are just so many choices to consider and so many different variables. Wow, I’m hoping I don’t purchase the wrong one! Any tips for a struggling mom? If your son is just starting to play, you better buy him a fiberglass stick. To use all the benefits of a stick of carbon fiber, he must first acquire the skills of the initial level. With a fiberglass stick it is easier to do. The Cranbarry Breakaway looks like such a fun stick! They come in so many great colors. Perfect for the kids. Does this brand make sticks for the more advanced players too? I’d just like to purchase my kids’ sticks at the same time from the same company to save time and shipping. I was afraid your list would just be hockey sticks simply for advanced players. I’m glad you included a stick for the beginners. My daughter has recently joined a rec team and I think she really enjoys it so I’m getting her, her very own stick.